There are many types of exfoliation we can do in the aesthetic treatment room. We are going to focus on the mechanical type of exfoliation in facials. Here are several popular methods used. 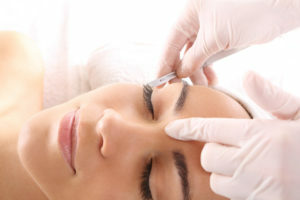 Dermaplaning – Dermaplaning has been around for a long time but has become very popular in the last couple of years. It is one of the most popular types of skin treatments offered in a skin care clinic. It removes the vellus hair and dead skin from the surface. Dermaplaning leaves the skin smooth and radiant. Skin feels amazing and when makeup is applied the clients skin looks smooth. The tool is used to scrape the dead skin and hair away. Tone with AHA toner to great skin ready for Dermaplaning treatment. Papaya Pineapple Enzyme Mask after deramplaning helps remove any dead skin that is left. Will leave skin glowing and polished. Microdermabrasion – Microdermabrasion is another staple that is a must have. Microdermabrasion can be used to remove dead skin and helps to soften tough, rough skin. It also helps to remove debris and dirt from pores. Microdermabrasion is a great tool to help remove black heads from the nose area. This is a great treatment for the pores around the T-zone. Always remember to adjust the vacuum portion depending on the skin type. Too much vacuum can create broken capillaries. Prep with a double cleanse using Facial Cleansing Gel, Clarifying Cleanser if skin is oily, combination or acne prone. Pumpkin I or II Enzyme Mask after microdermabrasion helps remove any dead skin that is left. Will leave skin glowing and polished. This treatment room staple is a great one to have on hand. It provides a gentle exfoliation that works well on most skin types. The ultrasonic vibrations will help to remove the superficial dead skin from the surface. This is a great treatment to offer in a facial. The skin scrubber also helps penetrate products when you flip the hand piece. Tone with AHA toner to great skin ready for Skin Scrubber treatment. Papaya Pineapple Enzyme Mask after microdermabrasion helps remove any dead skin that is left. Will leave skin glowing and polished. Let us know what your favorite treatments are for exfoliation.